Monk’s Blend got me curious before I even smelled the tea because of the description on the DavidsTea website. 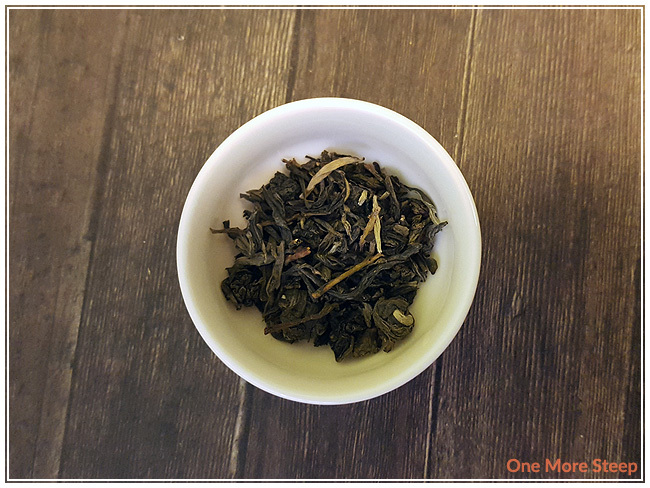 Monk’s Blend is a blend of white, green, and milk oolong teas – which is interesting in itself as I’ve tried other teas called Monk’s Blend before, but those have always been flavoured black teas. Monk’s Blend has this nice mixture of smells – there’s the light floral notes of jasmine, mixed with the smell that reminds me of heavy cream of butter. 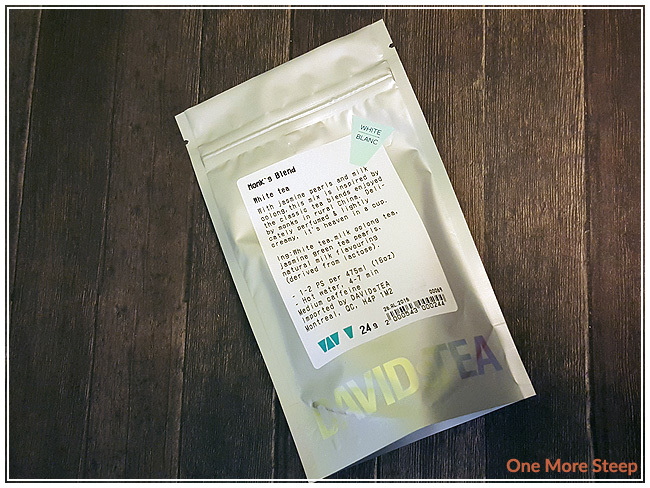 DavidsTea’s version of Monk’s Blend consists of white tea, milk oolong tea, jasmine green tea pearls, and natural milk flavouring. DavidsTea’s recommendation for steeping Monk’s Blend is to steep in hot water for 4 to 7 minutes. According to the website (not the label), “hot” is 75-80°C (167-176°F). That steeping time is much too long (in my opinion). White teas should be steeped for 2-5 minutes, oolong for 2-3 minutes, and green teas for 1-3 minutes. I opted to do the first steep of Monk’s Blend for 2 minutes. Monk’s Blend steeps to a pale greeny-yellow colour in two minutes. There’s a really nice buttery quality to the smell that mingles well with the floral. I can definitely taste a grassy flavour, as well as sweet jasmine and the buttery cream from the oolong. The buttery quality to the flavour isn’t as rich as from Guangzhou Milk Oolong, but it is still quite rich and pleasant. It’s a mix of flavours that play well together and is a pleasant cup of tea. Steeping for two minutes resulted in a smooth cup of tea with no bitterness. I resteeped this tea for an additional four steeps. The buttery cream flavour in the tea starts to wane with the more steeps done, but the floral and grassy components of the flavour are more prominent with subsequent steepings. I added an additional 30 seconds per steep. 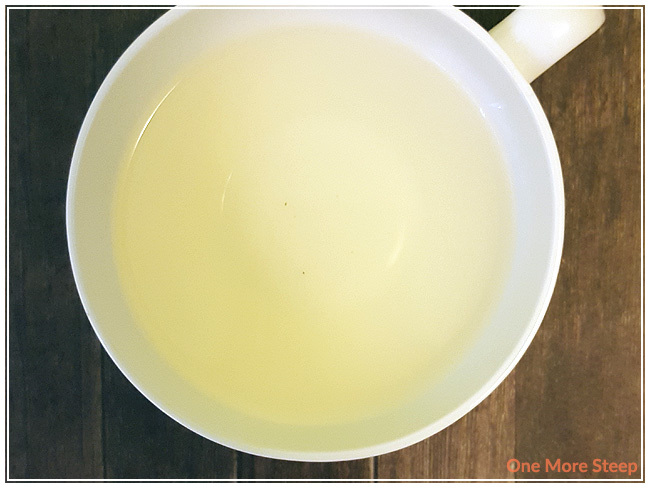 Monk’s Blend becomes a deeper yellow when you steep it for a longer period of time. I liked DavidsTea’s Monk’s Blend. I found this tea to be very interesting – in part because it’s such an interesting mix of teas and because it isn’t a flavoured black tea like I was expecting from the name of the tea. 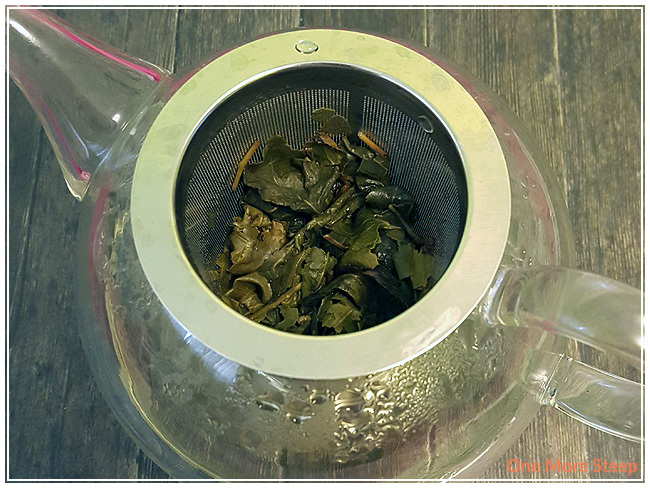 I love the complexity in the flavours of this tea, you can definitely pick out the flavours that each tea base brings to the cup which is very enjoyable. I think that DavidsTea does need to correct the recommended steeping time for this tea, 4 minutes is far too long for most of these teas (but especially for the green tea). While allowing the jasmine green tea pearls to unfurl is important, allowing them to do so for far too long is a detriment to the tea itself. Nobody likes bitter tea, especially when it can be prevented! If you do try Monk’s Blend, I would recommend steeping for short periods of time, and do many steeps. It resteeps very well and can make many cups of tea from the same tea leaves.